If base class has constructor then child class or derived class are required to call the constructor from its base class. Following programming example has two constructors in base class. One is default constructor and other has a string parameter message. In child class all these two constructors are called and print message on console. In this chapter you learned how to define constructor in base class and call it in child class. C# Inheritance Constructor is very useful when you need to pass value to base class from child class. 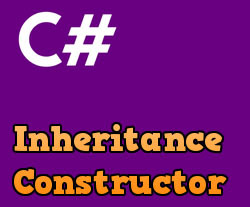 In the next chapter you will learn  Multiple Inheritance in C#.